It’s red carpet hairstyle season once again! You probably spent most of your time scouring the red carpet for ideas and inspiration from A-list celebrities and personalities for fashion and hairstyle trends. And we did get quite a lot of them in the recent red carpet appearances, particularly noting the 2015 Golden Globes Awards and the 2015 Critics’ Choice Awards. If you are looking to get some celebrity hair inspiration or hairstyle trend ideas worth trying this new year, make sure to check them out below. This was one of the most talked-about looks during the 2015 Golden Globe awards not just for her stunning gown, but also for her perfectly styled bombshell waves. Experts recommend that you start by allowing hair to naturally dry first. Then, use clip-in extensions to create volume, especially around the crown area. Work on dividing two-inch sections of hair for the extensions to look natural. If you want to create more volume, simply place the extensions higher on the head. When the extensions are clipped in, start backcombing the hair and spritz a long lasting hold hairspray. This will ensure that the perfectly volumized hair stays that way all night. Then, use a 2-inch barrel curling iron to add soft curls to the hair. The soft but defined curls will bring that retro vibe to the hairstyle, just like it did for Jennifer Lopez. Who said that braids are going to lose steam in 2015? Definitely not true! Celebrities Emily Blunt and Joanne Froggatt proved that braids are here to stay. Both women sported Grecian braids on the red carpet! Another hairstyle trend that has proven its staying power – the lob! In fact, this is one of the most talked about hairstyles on the red carpet during the award season so far. Sienna Miller’s perfectly textured lob to Naomi Watt’s soft curls . . . there are several hairstyling ideas to get inspiration from at the red carpet. This is one of the most difficult hairstyles to pull off, but nonetheless one of the most head-turning, too. Hair that is styled super sleek and straight (in some cases even with a wet look) was quite a hit on the red carpet as showcased by celebrities like Marion Cotillard, Camilla Alves and Maria Menounos. There is nothing more romantic and glam than hair that is curled to perfection. Whether it’s a retro side swept curls or a touch of wavy ends, you can expect for this hairstyle to never be missing on the red carpet. Fun and unexpected accessories can definitely perk up a regular hairstyle. The addition of these unique hairstyles certainly made Emma Stone’s and Keira Knightley’s hairstyles stand out even more. What was your favorite red carpet hairstyle so far this year? Any of these hairstyles you want to try? February 3, 2015 By: Abby Pringles Leave your comments (3), Your input matters. Beyonce’s new hair color makes her glow! It’s not that the dark hair was bad on her, but just look at the difference some warmth makes with her skin tone. The highlights add depth and much more interest to her long layered hair style. She bounces between wearing her hair straight and with soft curls, but the color change this year for her was what makes me add her to the top of the list of, celebrity hair styles. The picks of “Best Celebrity Hair Styles,” are popping up by beauty bloggers everywhere, (as well as the “Worst Celebrity Hair Styles.”) But, today I would just like to throw a few of my favorites into the hat. I’ll probably also give my opinions on what I think were some of the worst hair styles later. 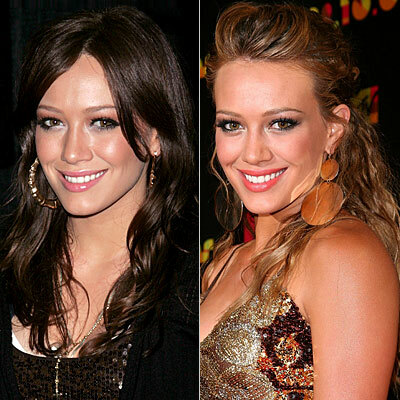 Celebrity hairstyle changes happen relatively quick in Hollywood, but some are more memorable than others. Many kudos to Gwyneth Paltrow’s hairdresser who scored big with this simple, but oh so lovely, hairdo change for her. My guess would be that Ms. Paltrow is not one who is especially comfortable with making changes. (I, for one, have secretly been hoping she would make a change for quite a while now.) 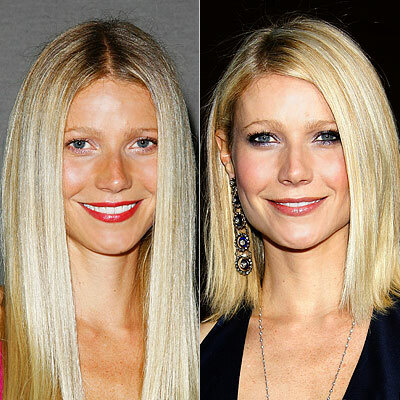 By cutting her hair into an elegant bob, it’s not too scary for Gwyneth to adjust to. It also is a perfect length for her face and body type, just touching her shoulders. She can still wear her hair in an up-do, straight or wavy! It goes to show it’s true that a small change in hair style can make a big difference! Gutsy! Beckham went for it! She not only cut her notorious inverted bob off . . . but went dark and pixie short haircut at the same time!! This also was a brilliant move by her hairdresser! You gals know how hard it is to get two great hair styles in a row. But, she’s done it, and not too soon, as she was getting dangerously close to becoming really dated with her old bob. This pixie haircut fits her especially well because of her small, petite facial features. Bravo! She’s set another celebrity hair winner! 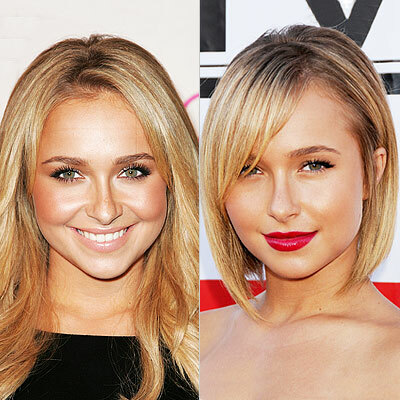 Hayden is all grown up in this super, sophisticated bob. She took the plunge and it paid off well for her. Bob’s were huge this year and almost all who took the plunge, allowing multiple inches of long locks to drop to the floor, made a good change! Another celebrity lightens it up and looks great! If you are a natural deep brunette and are considering doing what Hilary or Beyonce have done, you might do well to try on a few different colored hair pieces before jumping in. Get an idea if you prefer warm golden tones, or cooler beige tones or warm red high lights compared with cool red tones. Bring a trusted friend who can give you some objective feedback. Although celebrities can change around like chameleons at times, you can save yourself money and hair damage by seeing before committing! May 2, 2014 By: Barb Quinn Leave your comments (0), Your input matters.